Peter Coveney, along with Hugo Falter of EPT4HPC, Mariano Vazquez of BSC-CNS, and Cristin Merritt of Alces Flight held the first ever Birds of a Feather in Personalised Medicine at SC18 in Dallas, TX. With an audience attendee group hailing from around the world we discussed the latest research, highlighted resources, and the heard about the newest spin-off from BSC-CNS: ELEM Biotech. Peter led the proceedings on the latest research coming from the Centre of Excellence, with a focus on the significant growing levels of publications and projects in play. 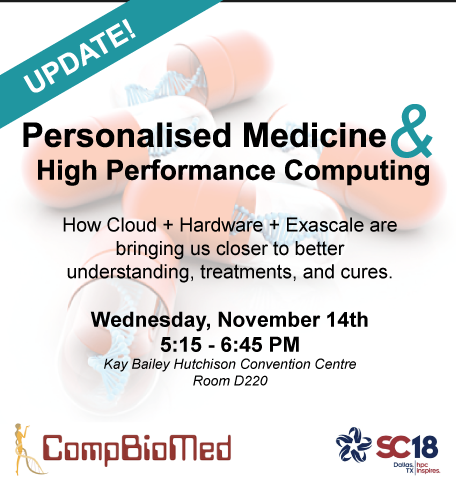 Leading on from Peter, Hugo discussed the objects of the ETP4HPC think tank with the focus on how HPC can enable the medical field at nearly all levels – from research to the clinical setting. Mariano then played out the aspirations of the biotechnical aspects of HPC in their aims to build from the Virtual Human project into real replications and modelling of human physiology with ELEM Biotech. Cristin then took the stage to discuss what pathways were emerging with cloud HPC technology, focusing on the use of containers as a potential outreach point for collaboration and mass data collection. After presentations the group held an informal discussion with researchers most interested in what the UK and EMEA were looking to achieve in the coming years. This discussion carried on from the event itself, allowing researchers from the USA to liaise with our CompBioMed Team. This was a great opportunity for us to reach out into the international community to gather new insights for future work. Thank you to everyone who participated. Special thanks to the Barcelona Supercomputing Centre (BSC) and Alces Flight Limited for their contribution towards making this BoF possible.